GREAT MILES 3,505! Smoke Metallic exterior and Medium Stone interior. iPod/MP3 Input, Onboard Communications System, Smart Device Integration, Alloy Wheels, Turbo Charged, Back-Up Camera. AND MORE! Back-Up Camera, Turbocharged, iPod/MP3 Input, Onboard Communications System, Aluminum Wheels, Smart Device Integration. Rear Spoiler, MP3 Player, Keyless Entry, Steering Wheel Controls, Child Safety Locks. 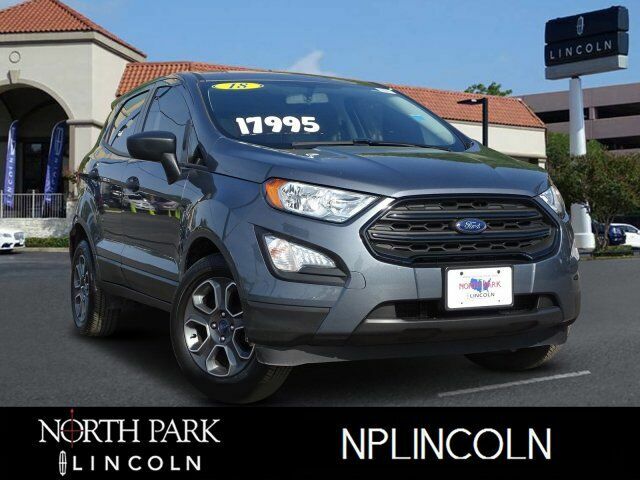 2018 Ford EcoSport with Smoke Metallic exterior and Medium Stone interior features a 3 Cylinder Engine with 123 HP at 6000 RPM*. Great Gas Mileage: 29 MPG Hwy. We at North Park Lincoln feel that today`s buyers are more educated. They understand that a vehicle`s value is determined by demand and availability, not by what we paid for it, or how long we have owned it. Instead of inflating our prices and hoping to win a negotiating contest, we perform a comprehensive search for similarly equipped vehicles in the marketplace up to 500 miles away to find the current market value so we can offer you the best deal up front with our no hassle Posted Pricing.